An animal-rights activist says an endangered right whale stranded on a beach in southern Brazil for two days is too weak to be rescued and returned safely to the sea. Elizabeth Carvalho da Rocha is head of the right-whale protection area in Brazil. She is quoted by Globo television's G1 website as saying the 40-ton, 50-foot-long (15-meter-long) whale was probably in frail condition when it beached itself because it is "very difficult for a healthy animal to get stranded." 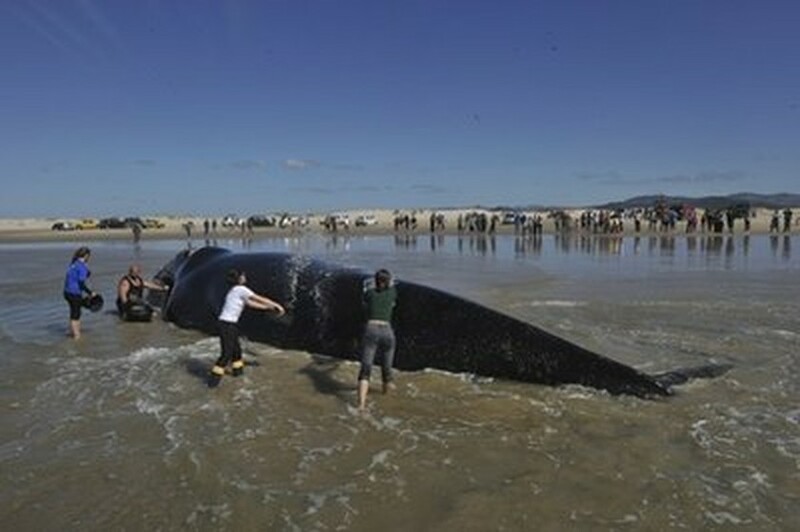 The whale ended up in shallow water at the Praia do Sol beach, on Brazil's southern coast. Rocha said Thursday that biologists would continue to monitor the whale's vital signs but there were indications it wouldn't survive much longer. She said biologists were considering euthanizing the whale to minimize its suffering.